My graduate students and I study various aspects of fish ecology and fisheries management. One focus is on fish habitat use and movement patterns in regards to habitat patchiness in streams. We are interested in what constitutes a habitat patch, how these patches are rearranged by disturbances such as floods, and what factors influence fish movement among patches. Other research areas include how warmwater fish species in the Rocky Mountains region will respond to climate change; the interaction between climate change and invasive fish species; and the homogenization of aquatic biota across the world through habitat alteration and species introductions. Much of our research involves species of conservation concern including native trout and nongame fishes such as native minnows in prairie streams. The Laramie River is a prairie stream with occasional gallery forests of cottonwoods and willows. We are studying how fish use habitat patches such as woody debris and how spring floods influence the dynamics of these patches. The photo to the left shows the Laramie River during low flows in late summer. The photo to the right shows the same reach during spring runoff. High flows rearrange habitat patches annually and we are interested in how fish respond to this disturbance. Eriek Hansen is a doctoral student who is examining how loss of winter ice cover due to climate warming might affect the behavior and physiology of fishes in streams of the western U.S.
Dan Gibson-Reinemer is a doctoral student who is examining how warmwater fishes will respond to the potential increase in warmwater habitats in the Rocky Mountain regiondue to climate warming. We are investigating how intentional fragmentation of aquatic systems can sometimes be beneficial by preventing the spread of invasive species, preventing hybridization or keeping species from entering ecological traps such as irrigation canals. 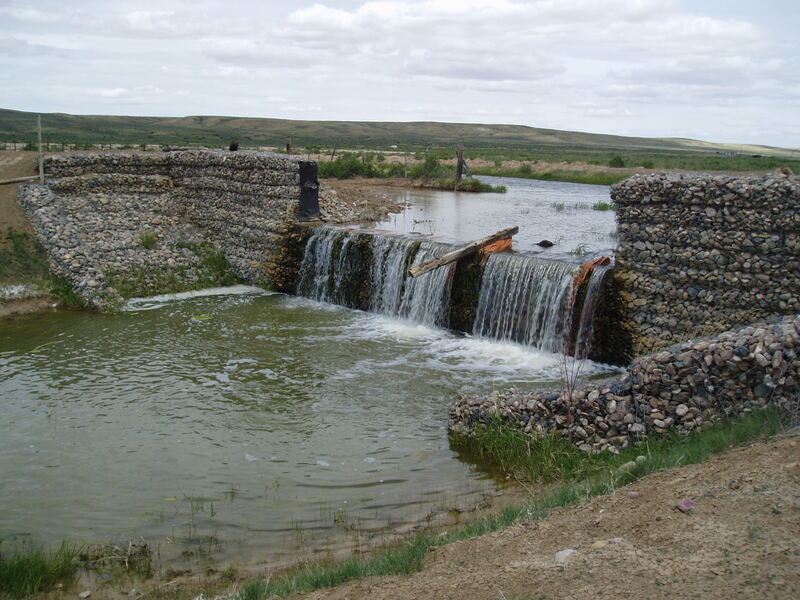 Above is a rock gabion dam that limits the upstream spread of some nonnative fishes in Muddy Creek, WY. If you are interested in doing graduate work in fish ecology or fisheries management, please send me an email indicating your areas of interest and career goals. It would be helpful to include a resume along with recent transcripts and GRE scores. General information about the graduate program of the Department of Zoology & Physiology is at http://www.uwyo.edu/zoology. I also supervise doctoral students in the Program in Ecology and information about this program can be found at http://www.uwyo.edu/pie/. Quist, M., WA. Hubert, & F.J. Rahel. 2005. Fish assemblage structure following impoundment of a Great Plains river. Western North American Naturalist 65:53-63. Fisher, W.L. and Rahel F.J. 2004. Geographic information systems applications in stream and river fisheries. Pages 49-84 in W.L. Fisher and F.J. Rahel, editors. Geographic information systems in fisheries. American Fisheries Society, Bethesda, MD. Johnstone, H.C. and F.J. Rahel. 2003. Assessing temperature tolerance of cutthroat trout based on constant and cycling thermal regimes. Transactions of the American Fisheries Society. 132:92-99. Schrank, A.J., F.J. Rahel, and H.C. Johnstone. 2003. Evaluating laboratory-derived thermal criteria in the field: an example involving cutthroat trout. Transactions of the American Fisheries Society. 132:100-109. Kruse, C.G., W.A. Hubert, and F.J. Rahel. 2001. An assessment of headwater isolation as a conservation strategy for cutthroat populations in the Absaroka Mountains of Wyoming. Northwest Science 75:1-11. Rahel, F.J. 2002. Using current biogeographic limits to predict fish distributions following climate change. Pages 99-110 in N. McGinn , editor. Fisheries in a Changing Climate. American Fisheries Society Symposium 32:99-110. Bethesda, MD. Rahel, F.J. and N.P. Nibbelink. 1999. Spatial patterns in relations among brown trout distribution, summer air temperature, and stream size in Rocky Mountain streams. Canadian Journal of Fisheries and Aquatic Sciences. 56(Supplement 1):43-51. Taniguchi, Y., F.J. Rahel, D.C. Novinger, and K.G. Gerow. 1998. Temperature mediation of competitive interactions among three fish species that replace each other along longitudinal stream gradients. Canadian Journal of Fisheries and Aquatic Sciences 55:1894-1901. Patton, T.M., F.J. Rahel, and W.A. Hubert. 1998. 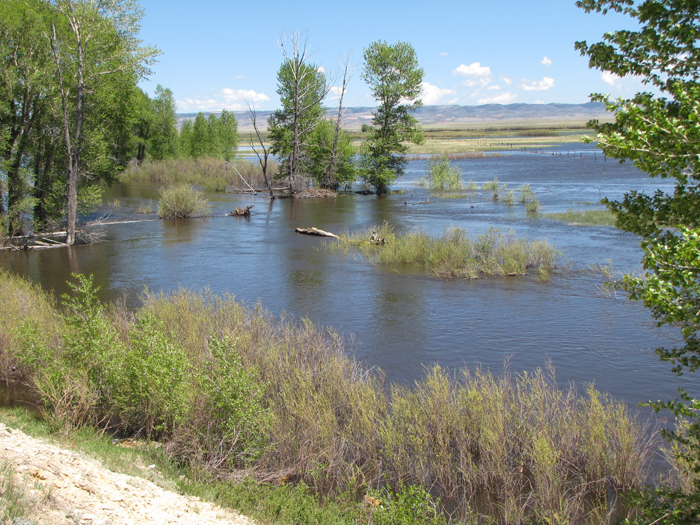 Using historical data to assess changes in Wyoming’s fish fauna. Conservation Biology 12:1120-1129. Thompson, P.D. and F.J. Rahel. 1998. Evaluation of human-made barriers in small Rocky Mountain streams in preventing upstream movement of brook trout. North American Journal of Fisheries Management 18:206-210. Rahel, F.J. 1997. From Johnny Appleseed to Dr. Frankenstein: changing values and the legacy of fisheries management. Fisheries 22(8):8-9. Kruse, C.G., W.A. Hubert, and F.J. Rahel. 1997. Geomorphic influences on the distribution of Yellowstone cutthroat trout in the Absaroka Mountains, Wyoming. Transactions of the American Fisheries Society 126:418-427. Rahel, F.J., C.J. Keleher, and J.L. Anderson. 1996. Potential habitat loss and population fragmentation for cold water fish in the North Platte River drainage of the Rocky Mountains: Response to climate warming. Limnology and Oceanography 41:1116-1123. Thompson, P.D. and F.J. Rahel. 1996. Evaluation of depletion-removal electrofishing of brook trout in small Rocky Mountain streams. North American Journal of Fisheries Management 16:332-339. Keleher, C.J. and F.J. Rahel. 1996. Thermal limits to salmonid distributions in the Rocky Mountain region and potential habitat loss due to global warming: A Geographic Information System (GIS) approach. Transactions of the American Fisheries Society 125:1-13. Rahel, F.J. and J.W. Nutzman. 1994. Foraging in a lethal environment: predation by fish on Chaoborus in the hypoxic zone of a stratified lake. Ecology 75:1246-1253. De Staso, J. III and F.J. Rahel. 1994. Influence of water temperature on interactions between young Colorado River cutthroat trout and brook trout in a laboratory stream. Transactions of the American Fisheries Society 123:289-297. Kolar, C.S. and F.J. Rahel. 1993. Interaction of a biotic factor (predator presence) and an abiotic factor (low oxygen) as an influence on benthic invertebrate communities. Oecologia 95:210-219. Johnson, S.L., F.J. Rahel, and W.A. Hubert. 1992. 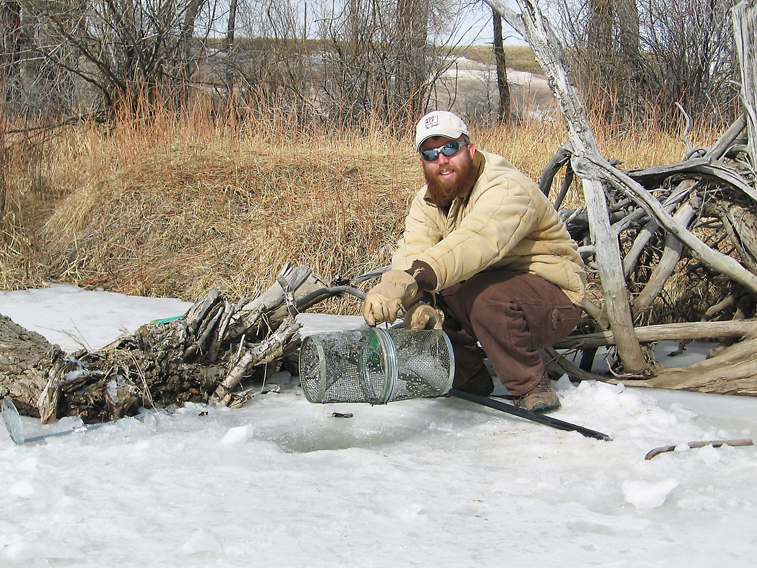 Factors influencing the size structure of brook trout populations in Wyoming beaver ponds. North American Journal of Fisheries Management 12:118-124. Bozek, M.A. and F.J. Rahel. 1992. Generality of microhabitat suitability models for young Colorado River cutthroat trout across sites and among years in Wyoming streams. Canadian Journal of Fisheries and Aquatic Sciences 49:552-564. Rahel, F.J. and W.A. Hubert. 1991. Fish assemblages and habitat gradients in a Rocky Mountain-Great Plains stream: biotic zonation and additive patterns of community change. Transactions of the American Fisheries Society 120:319-332. Bozek, M.A. and F.J. Rahel. 1991. Assessing habitat requirements of young Colorado River cutthroat trout by use of macrohabitat and microhabitat analysis. Transactions of the American Fisheries Society 120:571-581. Bozek, M.A. and F.J. Rahel. 1991. Comparison of streamside visual counts to electrofishing estimates of Colorado River cutthroat trout fry and adults. North American Journal of Fisheries Management 11:38-42. Rahel, F.J. 1990. The hierarchical nature of community persistence: a problem of scale. The American Naturalist 136:328-344. Rahel, F.J. and C.S. Kolar. 1990. Trade-offs in the response of mayflies to low oxygen and fish predation. Oecologia 84:39-44. Winkle, P.L., W.A. Hubert, and F.J. Rahel. 1990. Relations between brook trout standing stocks and habitat features in beaver ponds in southeastern Wyoming. North American Journal of Fisheries Management 10:72-79. Rahel, F.J. 1989. Nest defense and aggressive interactions between small benthic fish and crayfish. Environmental Biology of Fishes 24:301-306. Rahel, F.J. 1989. Simulation of vertical limnological gradients. Journal Freshwater Ecology 5:247-252. Hubert, W.A. and F.J. Rahel. 1989. Relations of physical habitat to abundance of four nongame fishes in high plains streams: a test of Habitat Suitability Index models. North American Journal of Fisheries Management 9:332-340. Rahel, F.J. and R.A. Stein. 1988. Complex predator-prey interactions and predator intimidation among crayfish, piscivorous fish, and small benthic fishes. Oecologia 75:94-98. Rahel, F.J. 1986. Biogeographic influences on fish species composition of northern Wisconsin lakes with applications for lake acidification studies. Canadian Journal of Fisheries and Aquatic Sciences 43:124-134. Rahel, F.J., J.D. Lyons and P.A. Cochran. 1984. Stochastic or deterministic regulation of assemblage structure. It may depend on how the assemblage is defined. The American Naturalist 124:583-589. Rahel, F.J. 1984. Factors structuring fish assemblages along a bog lake successional gradient. Ecology 65:1276-1289. Magnuson, J.J. J.P. Baker, and F.J. Rahel. 1984. A critical assessment of effects of acidification on fisheries in North America. Philosophical Transactions of the Royal Society of London. B305:5010516. Rahel, F.J. 1983. Population differences in acid tolerance between yellow perch Perca flavescens from naturally acidic and alkaline lakes. Canadian Journal of Zoology 61:147-152. Rahel, F.J. and J.J. Magnuson. 1983. Low pH and the absence of fish species in naturally acidic lakes: inferences for cultural acidification. Canadian Journal of Fisheries and Aquatic Sciences 40:3-9. Rahel, F.J. 1981. Selection for zinc tolerance in fish: results from laboratory and wild populations. Transactions of the American Fisheries Society 110:19-28. Rahel, F.J. and D.A. Jackson. 2007. Chapter 18: Watershed-level approaches. (pp 887-946) In C. Guy and M. Brown, editors. Analysis and Interpretation of Freshwater Fisheries Data. American Fisheries Society, Bethesda, MD. Fisher, W.L. and F.J. Rahel. Editors. 2004. Geographic information systems in fisheries. American Fisheries Society, Bethesda, MD. Rahel, F.J. 2004. Introduction to GIS in fisheries. Pages 1-12 in W.L. Fisher and F.J. Rahel, editors. Geographic information systems in fisheries. American Fisheries Society, Bethesda, MD.